Attorney General William Barr has released a summary of special counsel Robert Mueller's Russian collusion report, which was sans collusion. Mueller had already noted on Friday that he would not be pursuing anymore indictments. But, some Democrats and media outlets are suggesting President Trump isn't in the clear just yet. Rep. Pramila Jayapal (D-WA) is one of several lawmakers suggesting it's "disingenuous" to say the report proves there was no collusion. "We need to look at everything - not just the summary conclusions but everything underneath," the progressive caucus member explained on CNN's "State of the Union" on Sunday. That type of thinking is incredibly exhausting to Republicans like Rep. Mark Meadows (R-NC). Dana Bash noted that some Democrats, including high profile ones like Rep. Adam Schiff, chairman of the House Intelligence Committee, have already threatened to use their subpoena powers if they don't get Mueller's full, unredacted findings. Meadows says that's "rich." "So everybody talking about a subpoena, you know, I find that really rich when we are talking about transparency," he said. "And some of the very people that are talking about a subpoena, Dana, are the ones who didn't want anyone to know that Fusion GPS was actually hired to dig up dirt on the president. They didn't want the Nunes memo released. I was one of the few that said release the Republican memo and release the Democrat memo." Despite no evidence of collusion, Democrats have led investigations into other aspects of Trump world in what Meadows calls "a pattern of harassment." "And yet we see that this is just a large dragnet, trying to find something to investigate," he said. "You need to look at the crime and investigate the crime, not go out and use the power of the government to dredge up some kind of wrongdoing." 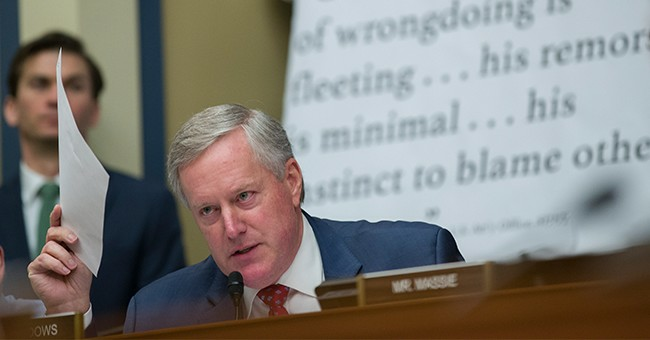 "I have been consistent, saying this president didn't collude," Meadows said. "And now it appears that the facts will support that." Rep. Jim Jordan (R-OH) echoed Meadows in an interview on ABC's "This Week." "We’ve got to read the report, but what I do know is to date not one bit of evidence to show any type of coordination, collusion, conspiracy between the Trump campaign and Russia to influence the election."